Craft: As our teachers are volunteers, craft tuition is free of charge. However, there may be some costs involved for materials. 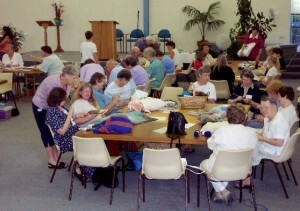 Most crafters bring their own craft to work on while chatting with other crafters. Parents and carers are requested to help in the crèche occasionally if needed. Basic Computing Classes ($5 per session). Ring the church office for information on how to register. Computer Support Group (meets occasionally on Thursday at 9:30am in the Auditorium). Beginner and intermediate level English classes for people from overseas who want to improve their English skills. Everyone is welcome to come along and participate in the craft classes and other activities, with no obligation to attend church services or other church events. However, Mosaic Baptist Church warmly invites you to enquire about our Sunday services and our various programs for men, women, young adults, teenagers and children and to join in with any group which may suit your needs or interests. To enquire about any groups that interest you, please ring the church office or contact us below.